What's all this I hear about dry-hopping? What is it? 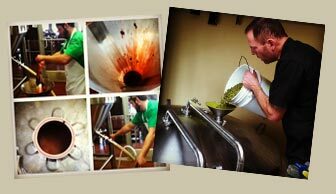 Hey Greg, Dry-hopping is the process of adding hops directly to a fermented beer. This gives the beer a huge hop aroma without imparting any additional bitterness. Thanks for writing in, and keep those questions coming! Beginning April 10th, we’re serving up a delicious meal for meat lovers – a 1/2 slab of ribs locally smoked at the Sausage Factory, fries, and cucumber salad with a Honey Porter BBQ sauce on the side. Our Brew-Off Buffet will include Garden Salad, Cucumber Salad, Fresh Baked ICKY Bread, Assorted Grilled Sausages, Pasta with Marinara or Garlic Cream Sauce, Mashed Garlic Red Potatoes and Sautéed Seasonal Vegetables. Pizza from your favorite brewery. The comfort of your own couch. Pick up a take-n-bake pizza from our Reno Brewery and enjoy the hot deliciousness of Great Basin Brewing Company’s specialty pizzas right from your oven! 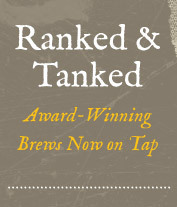 And while you’re here, might as well pick up a growler of your favorite brew. What else you gonna drink with pizza? A spritzer? KNOW YOUR BEER. KNOW YOUR BREWER. Follow us on INSTAGRAM for a behind the scenes look at what our brewers and chefs are up to. Experience the true taste of Nevada. We’ll be pouring outside our Sparks Brewery for the festival – come visit us, taste some handcrafted Nevada brews, and enjoy the live music and sunshine on our patio!